British Genovese Basil | Henry Field's Seed & Nursery Co. 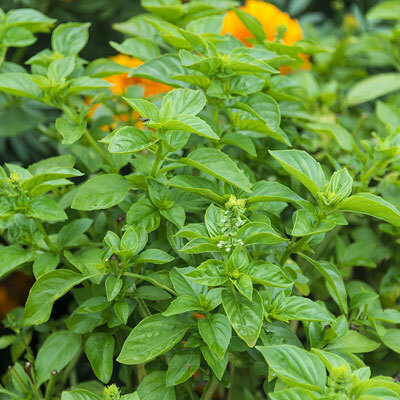 This breakthrough basil is more resistant to cold weather than other types, yet holds well in the garden all summer long. Its wonderfully distinct aroma is essential in pestos, sauces, soups and more! Annual. 80 DAYS. Germination 5 - 7 days at 68-75 degrees F.
For each offer ordered, get approx.150 seeds per pkt..
Foliage: Dark green foliage. Spicy fragrance and flavor. Pruning: Pinch back to encourage a bushy plant. Be careful not to remove too many leaves from one stem of young plants.